Kovil is not just a Home Stay. Its is a reflection of the age old culture and tradition of Fort Kochi - a combination of the heritage of the land and the colonial era, blended with the hospitality of a traditional family. At Kovil, we offer traditional Kerala cottage, as well as cozy individual rooms, to make your stay in Fort Kochi, a memorable one. Located in close proximity to the Amman Kovil Temple, we offer you a typical experience of traditional Hindu culture and living. The streets and dwellings in the area, still portray the age old Hindu culture and habitat. Our guests get to experience this traditional live style as well as to learn various art forms, music and musical instruments. 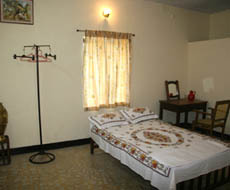 Kovil Home Stay provides individual rooms as well as traditional cottage, for accommodating the guests. All rooms, including the traditional rooms in the cottage, have double coat beds with attached Eurpean style toilets, along with other facilities like bed side table, wardrobe, study table, mirror, chairs, etc. The cottage, with traditional tile roof and wooden ceiling, has a coartyard with a small lawn and garden. The common area include a nice "verandha" where your can sit back and enjoy the breeze from the lawn. The rooms have insect proof windows with neatly furnished interiors. There is a common living area to spend your time watching the telivision or listening to the music system. We have a well equipped kitchen, exclusivily for the guests. A refridgerator, gas table, utensils, cuttlery, hot n cold storage containers, etc, make your stay at Kovil, a homely affair. Apart from the guest kitchen, we have a full fledged kitchen, for the family. The cookery classes and preparation of special traditional Kerala dishes are carried out here. The cottage, with traditional tile roof and wooden ceiling, has a coartyard with a small lawn and garden. The common area include a nice "verandha" where your can sit back and enjoy the breeze from the lawn. The rooms have insect proof windows with neatly furnished interiors. There is a common living area to spend your time watching the telivision or listening to the music system. We have a well equipped kitchen, exclusivily for the guests. A refridgerator, gas table, utensils, cuttlery, hot n cold storage containers, etc, make your stay at Kovil, a homely affair. Apart from the guest kitchen, we have a full fledged kitchen, for the family. The cookery classes and preparation of special traditional Kerala dishes are carried out here. Situated at Fort Kochi, one of the must see destinations, Kovil Home Stay is very near to the Heritage Zone of Fort Kochi and can be easily reached from the various attractive sports like the Beach, Synagogne, Dutch palace, St. Francis Church, Santacruz Basilica and the Chinese Nets of Fort kochi. The home stay, which offers a traditional living experience in a Hindu ambiance, is ideally located in one of the tradtional locales of Fort Kochi, with close proximity to the Amman Kovil Temple at Amaravathy, on the main road itself.